A tale of two cities: the commercial center and tourist hub of Singapore, including the postcard darling Marina Bay Sands Hotel and Casino (not pictured), differs greatly from the city-state's more typical landscape—modernist, high-rise public housing blocks built by the Housing & Development Board. As with many cities around the world, the part of Singapore that frequently fills post cards, movie screens, and Instagram is its city center. An impressive array of skyscrapers, Ferris wheels, gravity-defying architecture, and light shows, the city-state’s downtown understandably drops jaws with its unending display of architectural prowess and expense. 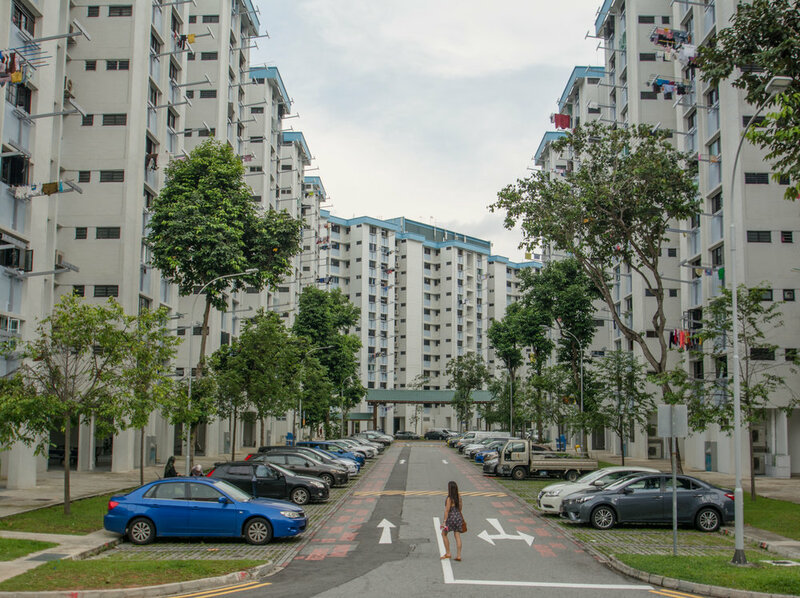 The side of Singapore that most people don’t see—much less celebrate, aside from some photographers focused on cataloging Singapore’s particular breed of modernism—is the part where 80% of its 5.6 million people live: public housing. Since 1960, Singapore’s Housing and Development Board (HDB) has built over one million residential flats throughout the country, providing “quality and affordable public housing for generations of Singaporeans.” A highly regulated system with quotas, agendas, and policies I won’t pretend to comprehend, the government’s decades-long role in designing, constructing, and developing most of the country has resulted in a very particular built environment. Fitting with the modernist era in which they originated, many of the earliest examples of Singapore’s public housing estates adhere to a brutalist aesthetic. More contemporary renditions add a splashes of color and variation, but overall, the outcome is similar: large complexes of buildings, each many stories tall and identical to the others in its “community,” save for the block numbers on its wall. The bottom floor is intentionally left open-air, meant to be an extension of communal public space and available for funerals, weddings, and other ceremonies whose importance seems incongruous with the bare surroundings. Ground-level parking is sandwiched on roads between and around the buildings. While access gates control the comings and goings of cars, pedestrians are free to enter any and all parts of the public housing that isn’t behind “private” doors. Grass, walking paths, playgrounds, basketball courts, and even the occasional community garden fill in the gaps between the buildings. Besides the high density of dwellings, much of Singapore outside of the downtown reminded me of suburban Florida. Like single-family subdivisions, the public housing estates consist of copy-and-paste architecture that make finding one’s way using architectural landmarks virtually impossible. While much of the ground is covered in verdant, inviting grass, little of the ample “greenspace” equates to adequate park space large or flat enough for pick-up soccer games. Rarely are the estates on a grid layout, and instead, they use many curving roads and dead-ends. Land uses are segregated, with non-residential uses concentrated in hawker centers, employment districts, and shopping malls in the “towns” associated with various housing estates. While distances are more manageable than those in suburban Florida, walking between one’s flat and the local food hub isn’t all that interesting or pleasant; many sidewalks are too narrow for the volume of users, and aren’t shaded nearly enough to combat the tropical heat. The government is now trying to encourage walkability in a country notorious for heat and rain by retrofitting over 120 miles of sidewalk with covered shelters. Many of the over one million public housing flats in Singapore are connected by the city-state's rail and bus networks. Residents must obtain a "Certificate of Entitlement" to operate a private automobile—which can cost as much as $36,000 USD after a bidding process. Coupled with other government mechanisms for reducing car ownership and use, such as congestion pricing and "low emission zones," results in high transit ridership among Singaporeans. And yet, unlike suburban Florida where almost 90% of people get to and from work by car, Singapore’s public housing program is largely successful in encouraging non-car dependent transportation. In 2015, the government estimated that 65% of all commute trips were on public transit, a phenomenon that is hard to deny when seeing hordes of people pour into and out of transit hubs across the country. This mode split did not happen by chance; Singapore’s tendency towards public transportation is yet another illustration of the government’s intense orchestration of society. To temper traffic congestion, the Singaporean government limits the number of drivers licenses administered each year, while also taxing cars to the point of unafforability for most citizens. 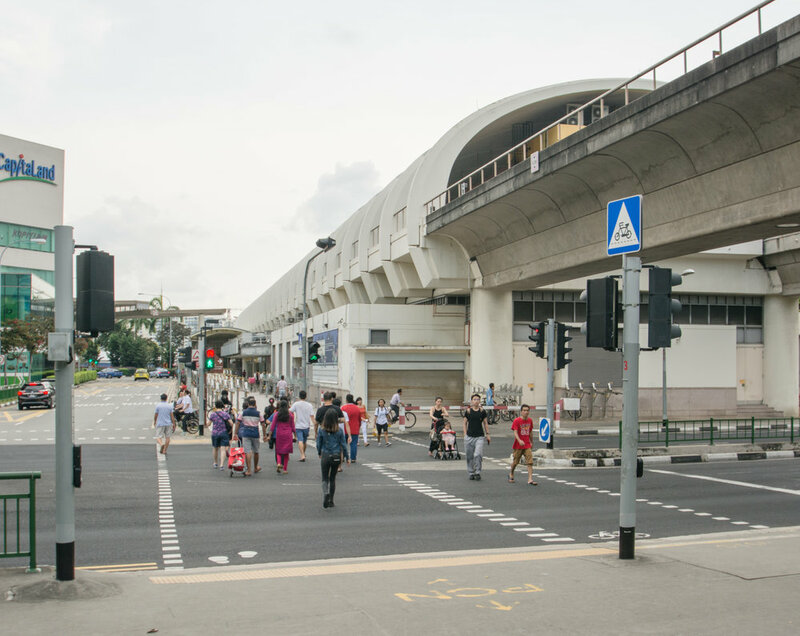 Other techniques, such as congestion pricing on major roads, strict rules for parking, and orienting housing estates around transit stops, help keep car ownership in Singapore at a mere 44% of all households. Given the government’s role in housing and transportation, it is easier to see why these public housing estates “work.” 80% of residents live in HDB’s public housing because that is the only way they can afford an apartment in such a controlled marketplace. They walk and bike between transit stops because, for many, that is the only choice they have. The public housing estates and public transit systems work because they must work. I admire a country so invested in its citizens and the environment that it prioritizes affordable housing and public transit to the point where 90% of public housing residents own their flat (or at least a 99-year lease on it) and more than half of the country regularly uses transit. But with my bias towards a European city aesthetic and an overall preference for grid networks, city blocks, mixed-use, pocket parks, large parks, green belts, and Jan Gehl-endorsed urban edges, I wonder why, when given an infinite list of urban forms to choose from, the HBD went with the housing block phenomenon? More importantly, I wonder: if the people of Singapore had more freedom to choose what kind of building, town, and place they wanted to live in, what would they choose?